Choosing a primary care provider (pediatrician or family doctor) for your baby is not easy. That is why it is very important to do proper research before your baby arrives. Be prepared to interview more than one doctor. Ask lots of questions, and make sure you feel very comfortable with the doctor you choose. Pediatricians are primary care doctors who specialize in providing care for newborns, children and teenagers. Pediatricians provide well-care and sick-care, give immunizations and provide developmental care as your child continues to grow. Pediatricians are available for any questions or concerns that you might have about your child's health. 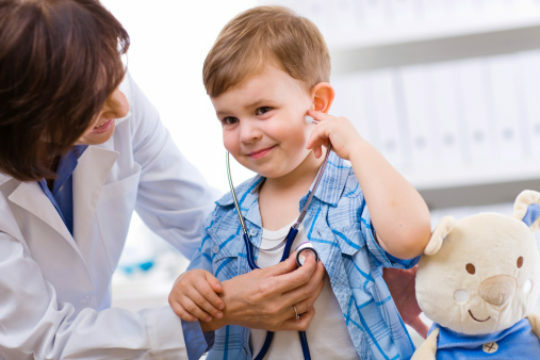 Family doctors are also primary care doctors; however, they differ from pediatricians in that they are specially trained to care for the entire family. How Do I Find a Pediatrician or Family Doctor? When deciding on a doctor for your baby, start off by finding out which doctors are covered by your health insurance company and which doctors are located close to your home. It might be beneficial to ask your OB/GYN or friends and family for any recommendations. Which Doctor Is Right for My Child? When you are going through the process of choosing a doctor for your child, meet with three or four doctors before making your decision. You might want to consider someone who is easily accessible and with whom you are comfortable talking about your child's health. Other important information you might want to consider includes office procedures, office location and the doctor’s background. In order to know what services to expect from the doctor, make sure to ask plenty of questions. If you aren’t sure where to begin, explore the question guide listed below about general office practices, office location and your doctor’s medical background. What time does the office open and close? Is the doctor available on any nights and/or weekends? With which hospital(s) is the doctor affiliated? Will my child be seeing the same doctor each visit? Is it near your home and work? Are there other offices around the area? Is he or she certified by the American Board of Pediatrics, or the American Board of Family Medicine?